After years of negotiations with American production companies and television networks, ARM is now progressing into broadcasting its first, exciting real life TV series. An instrumental role of the Animal Recovery Mission’s agenda lays in educating people of its criminal findings of some of the most unimaginable and concealed operations of animal cruelty, in the world. Obtained through its undercover investigations, ARMs work brings to light both the atrocities and challenges it encounters in promoting change for animal rights. For ARM, this not only serves as a necessary purpose, but stands as the organizations obligation to raise global societal awareness. The series will also be addressing many critical issues which the organization encounters in it’s efforts to disable existing industries of animal cruelty to save animals of abuse and neglect. These hurdles include working alongside official agencies and government departments. Viewers will get a rare insight, not only into the investigations themselves, but on the process of executing raids, animal rescues and the rehabilitation of rescued animals taken to at ARMs Sanctuary. Whilst ARM has the ongoing support of State Attorney offices and departments in many counties, often times ARM also receives resistance from relevant agencies who attempt to turn their backs on ARMs undeniable evidence. In the past, this has often jeopardized cases, as well as the necessary arrests and animal rescues phases of the organizations investigations. This weekly series, with the credibility of a reputable TV network highlighting ARMs work, stands to give these same agencies no choice but to assist our organizations work. Since its inception in 2010, ARM has filmed thousands of news and investigative reports stories, documentaries and feature appearances on a variety of Americas most popular, prime time network shows. ARM, in addition, is also the proud recipient of multiple and honorable awards from television and film industries, including an Emmy, for its stories highlighting ARMs role in defending animal cruelty. 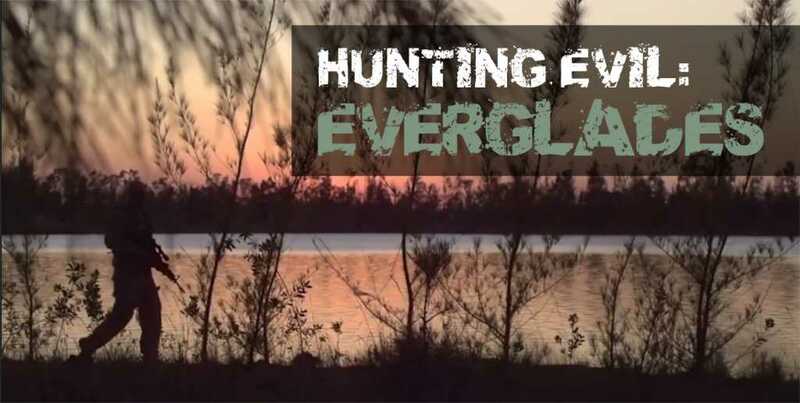 For the first time ever, the Animal Recovery Mission’s real life series ‘Hunting Evil – Everglades’, will be coming to prime time TV to portray the true horrors of what countless animals are enduring on a daily basis in the industries which ARM exposes. ARMs Founder, Richard ‘Kudo’ Couto, insists that this series will serve as an educational purpose with the content being filmed authentically and unscripted, never staged or swaying away from the realities of the every day struggles of the organizations operations and activities. ARM hopes that our supporters will enjoy this extended trailer and encourages everyone to please leave your comments on our Vimeo page, for ARM’s production company to consider your opinions on this series, before it launches. We look forward to the near future where the Animal Recovery Mission will be brought into your home, for one hour, every week!